Learn to configure the <relationship> element for Pull Reports™ Ad Hoc report and data service software. The <relationship> element specifies a SQL join relationship between two <table>s. within the Export Report REST API. Nest <relationship> elements beneath the report's base table to any depth to join additional information to the report's relational data tree. <table>s within <relationship>s are referenced within the Export Report REST API's columns, filter, and sort parameters via their table resource path, the unique forward slash (/) separated list of table ids which identifies the table within the join tree. <relationship>s SQL joins are always directional from the parent <table> to the child <table>. This directionality means that the parent <table> is always included in the Export Report REST API SQL join if the child <table> is included. Additionally, SQL joins from a table to a <relationship> child table are always a left outer or inner join. Right outer SQL joins are not supported. A to-many, <join_column> configuration is when one or more foreign key columns on the child table reference one or more columns on the parent table. This type of join must be cardinality="many". Configure this type of relationship with one or more <join_column> elements as direct children of the <relationship> element. The <join_column> columnName attribute references the child foreign key column, and the referencedColumnName references the parent key column. A to-one, <join_column> configuration is when one or more foreign key columns on the parent table reference one or more columns on the child table. This type of join must be cardinality="one". Configure this type of relationship with one or more <join_column> elements as direct children of the <relationship> element. The <join_column> columnName attribute references the parent foreign key column, and the referencedColumnName references the child key column. A to-many, <join_table> configuration requires an indirection table between the parent and child tables. The indirection table must have one or more foreign key columns that reference columns on each of the parent and child tables. Configure this type of relationship with a <join_table> element. Because of the similarity in purpose between <relationship>s and object relational mapping (ORM) technology, the Pull Reports™ Schema and Catalog Configuration Java API relationship vocabulary follows the Java Persistence API (JPA) mapping vocabulary. 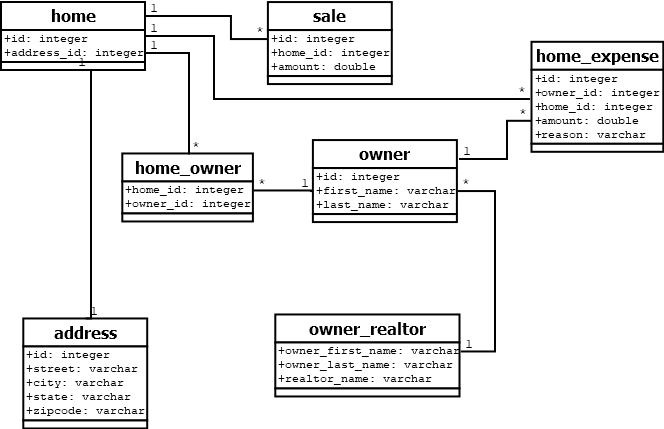 This example uses a real estate data model which contains information about home sales, the owners of homes, and the realtors used by an owner. The following diagram represents the six tables of the data model and the foreign key relationships between them. A home may have 0 to many sales but a sale is associated with one home. A home may have 0 to many owners and an owner may own 0 to many homes. A home has exactly one address. An owner may have 0 to one realtors but a realtor may have 0 to many owners. An owner may have many home_expenses. Each expense is associated with one home. Use a to-many, <join_column> join to left outer join the sale table to home with a <join_column> from sale.home_id to home.id. The <relationship> is one to many from home to sale. Use a to-many, <join_table> join to left outer join the owner table to home with a <join_table> element on the home_owner indirection table. The <relationship> is zero to many from home to owner. Use a to-one, <join_column> join to inner join the address table to home with a <join_column> from home.address_id to address.id. The inner join is appropriate if the home.address_id column may not be null. The <relationship> is one to one from home to address. Use a to-one, <join_column> join to left outer join the owner_realtor table to owner with two <join_column>s from owner.first_name to owner_realtor.first_name and owner.last_name to owner_realtor.last_name respectively. The <relationship> is many to one from owner to owner_realtor. Use a to-many, <join_column> join to left outer join the home_expense table to owner and home with two <join_column>s from owner_expense.owner_id to owner.id and owner_expense.home_id to home.id. The later join uses the <join_column> referencedTablePath attribute to indicate the referencedColumnName is on the home grandparent table of the relationship and not the parent table. The following Pull Reports™ configuration represents the data model within the Pull Reports REST API. See the comments within the XML for specific <column> configuration guidance. <!-- An owner has a many-to-one relationship with a realtor. This example demonstrates a compound key with two <join_column>s. JoinTable joinTable = new JoinTable("realestate.home_owner"
Specifies the cardinality of the join between the parent <table> of the <relationship> and the child <table> of the <relationship>. Permitted values are one or many. For to-many and to-one, <join_column> relationships, the cardinality attribute determines the location of the database columns referenced by child <join_column> columnName and referencedColumnName attributes. The Pull Reports™ Report Creator reflects the cardinality attribute via a "stacked" display within the Columns panel. Specifies the join type. Permitted values are left or inner. right outer joins are not supported.